Since the birth of the ADTB online courses – in 2005 – over 7,000 people from 56 countries have signed up for one or more courses. The ADTB is both recognised and respected by many canine related organisations. Jenni Watson has been involved with dogs from the age of 10 firstly owning a Miniature Poodle then a cross breed. In the early 70’s as an adult she began to train her German Shepherd puppy at a dog training club. She was totally smitten with the idea of teaching dogs how to do things. Within a year she began to compete at Competitive Obedience shows. By her own admission she has always been a slow learner and it is the acknowledgement of this fact that gives her the gift and patience to relate to other people who may be struggling to grasp things. Jenni has taken two of her own dogs, both rescues to the pinnacle of Championship competition and created two Obedience Champions. She has won 32 Challenge Certificates; the highest diploma available in the UK, appeared at Crufts in the Obedience Championships on 12 occasions and owned a Standard Poodle Breed Champion. Jenni is a Championship Obedience judge and had the honour of judging the Kennel Club YKC classes at Crufts. If asked “What is your favourite interest in dogs?” her answer would be “Training them to be Good Citizens and helping the plight of rescue dogs”. All her life Jenni has worked to raise funds for rescue dogs and societies. In the 80’s she walked from Darlington, Co. Durham to London (where she appeared at Crufts) to raise over £8,000 for rescue societies. The following year she organized a further walk which raised over £40,000. In 2002, she organized a “sponsored stay” where 336 dogs from Training Classes in every area of the UK performed a one minute “stay” at exactly the same time. This event resulted in a donation of over £18,000 being given to the “Make-A-Wish foundation” and a Guinness world record for the ADTB. 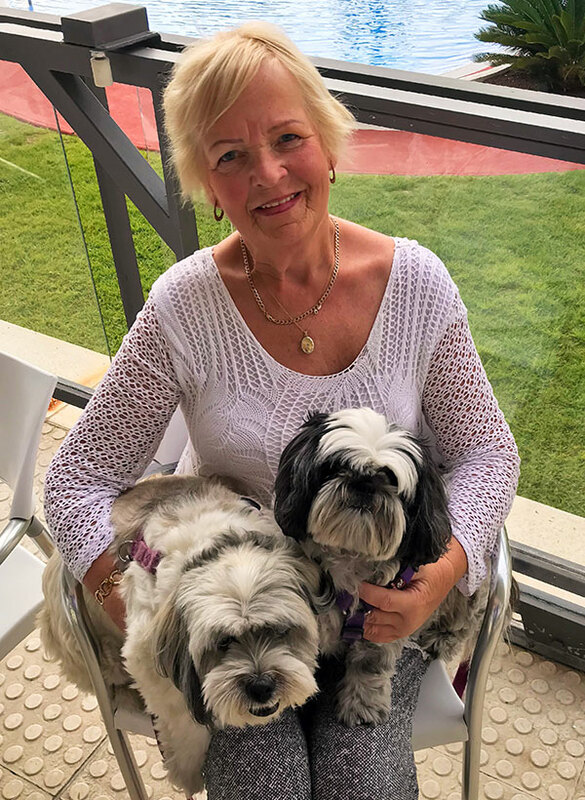 Since 1981 when she was first requested to run a seminar Jenni has travelled the country teaching others how to achieve the very best from their dog. She has instructed in many European countries and the USA. In all, she has held over 400 seminars and has provided a helping hand in the training of many of the top UK competition dogs. When Jenni ceased competing in the late 1990’s she turned her attention to trying to improve the facilities offered to pet dog owners. She ran several classes weekly in the Cleveland area of the UK, and found pet dog training and the requirements of the owners totally different to competitive work. She also realized that there was very little opportunity available for people who either wanted to study “How to become a Dog Trainer” OR those who were already in the business but wanting to update their training methods. Nowadays and after moving her home to Spain in 2004 Jenni spends most days of the week working in her office and is still as passionate about the ADTB as she was on the day it was launched. She lives with her husband Alan, who is a great support to her in her work. Jenni and Alan lost their last dog in 2016 and due to their age decided to live without a dog in the family for the first time. Though they are settled to this loss they are very much involved with the dogs of family and friends. Jenni believes that the world of Dog Training is moving forward every day and we must keep up with both knowledge and new initiative training methods. She also believes that no matter how long you have been involved with dogs we will never know enough, herself included. Finally, Jenni would like to thank all the many people who have studied the ADTB courses and welcome all new students.